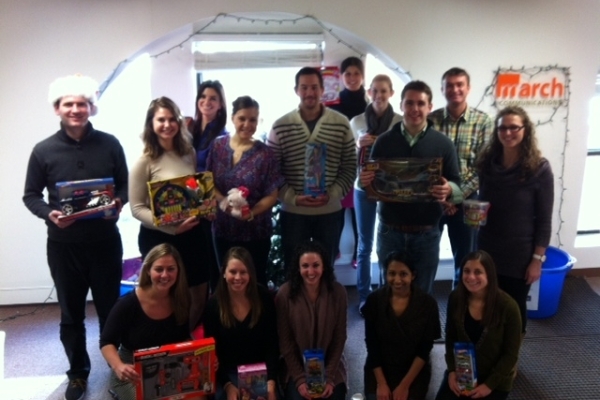 The March team is gathering toys for the Starlight Children's Foundation of New England for the second year in a row. The March team is gathering toys for the Starlight Children's Foundation of New England this holiday season for the second year in a row. With its regional office just a few minutes from March, we were introduced to Starlight in the fall of 2010 and have since collected toys for the children every holiday season. Upon receiving the kids' wish lists, which includes arts and crafts supplies, Boston sports memorabilia, board games, and more, the agency makes it a staff-wide initiative to fulfill the requests, as much as possible. We continue our relationship with Starlight beyond the holiday season. In June 2011, the event coordinator leaned on March for support for the STARmazing Race, a scavenger hunt across Boston. March provided pro-bono PR support for the event. March's goal is to collect more than 50 toys with our staff of 18 employees this season. By enlisting family and friends, we have successfully made strides to help as many children as we can. We have placed two large donation bins in our office lobby, reminding staff of the importance of giving, especially this time of year. The collected toys will be delivered by the agency to Starlight on December 21. March considers it part of our culture to give back to the community. Each year, we hope to expand the toy drive to reach more children and foster an even stronger feeling of giving within the agency.